T-Mobile has just announced on Twitter that it will be selling the Samsung Galaxy Tab 10.1 table soon enough, but without announcing a launch date. A 4G version of the slate is highly likely, but a WiFi-only unit wouldn’t surprise me at all. 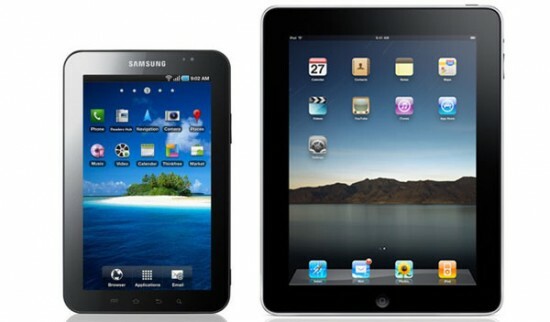 The Galaxy Tab 10.1 is one of the most controversial tablets out there, along with HP TouchPad. However, Samsung’s device wasn’t an on and off affair like the TouchPad, but rather a renegade device, first banned from some countries that thought it was too similar to the iPad and then returning like a prodigal son, after some lawsuits. T-Mobile will price this model at around $500 in its cheapest version that immediately draws comparisons with the iPad 2 or the just announced Amazon Kindle Fire. We have to remind you that the Galaxy Tab 10.1 is thinner and lighter than the iPad 2, hence all the drama between this device and the Apple slate, as the South Korean product is a real worthy competitor for it… but it does actually borrow from its design. Since Pocket-lint started App of the Day back in May 2010, we've covered over 300 interesting applications of all shapes and sizes. Games, productive utilities, educational and reference software titles have all passed through our sweaty mitts, and for a variety of platforms, to boot. However, what we've also realised in the process is that sometimes an app doesn't need to be anything other than a pleasant waste of time. An oddity that doesn't really fit into any general category. Digital ephemera. Developer Smule is something of a master at making interesting apps for iOS that can't really be generalised. They all, to a point, have a whiff of musicality about them, but in a more whimsical, peculiar and fascinating way. And MadPad HD (the iPad version) is most certainly all of those, and much more besides. It is, at its heart, an audio sequencer; a device to loop sounds in order to create percussive or musical clips. However, it does so with miniature video clips recorded from, basically, anything. 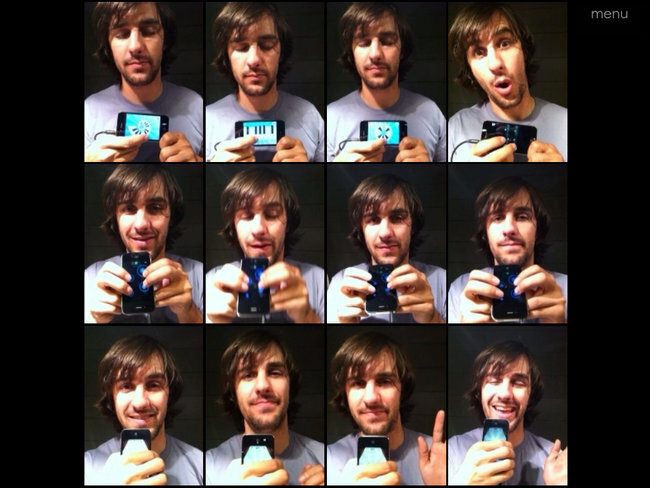 The tagline of MadPad HD (or the iPhone's MadPad) is "remix your life" and that's essentially what you can do. You can record 12 individual small clips of unique sounds, store them on your iPad (or in the cloud) and then play them back by tapping on each thumbnail. A basic looping function is included, plus you can record a larger sequence. Now, if you were to record, say, 12 different drums, that'd turn it into a visual drum machine; funky, but otherwise dull as there's so many other apps that can do a similar thing. But if you recorded your dad snoring... That's an altogether different kettle of fish. Come to think of it, you could even record a kettle of fish. You can also change the pitch and volume of each clip, effectively turning a person speaking into a Smurf or Barry White, or making a mundane noise, such as traffic, much more interesting. 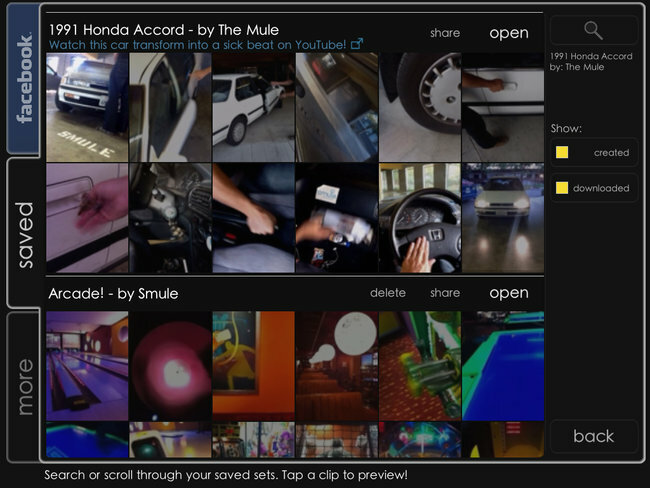 And, if you're completely out of inspiration, you can download entire sets of clips from Smule and other users. Similarly, you can upload your own for others to use, and share them through Facebook, Twitter or via email. And the sharing element doesn't even end there: once a complete song has been created, that can be shared with others too as a video file through YouTube. Naturally, as this is?predominantly?a video application, you will really need an iPad 2 to get the most from MadPad HD, after all, you won't be able to record clips if you don't have a camera. But you can still use any of the other sets to create your own mixes on a first generation iPad, so maybe there's some value in it for owners of the original tablet too. What we would advise, though, is that unless you're Damon Albarn (who should really bring out his own breakfast cereal - Albarn's All-Bran), making a successive racket of beeps and blips is not particularly commercial. But it is incredible fun. Surely, that's all that matters. Just think what you could do with a cacophony of rude words... Not that we would do anything like that, of course. A "monkey scrotum" would never pass our lips. Ahem. Pocket-lint has seen its fair-share of iPhone and iPad cases. In fact, we get sent so many of them to take a look at that we've built a small extension on the side of Pocket-lint towers using them as bricks. It hasn't been signed off as safe by the authorities, but the work experience lad seems happy enough out there. But it's been a while since we saw a range of cases that got the fanboy buried beneath all worked up. And that's exactly what Pipetto's HunterWanderer range has done. Designed with your iPhone 4 and your iPad 2 in mind, this isn't your run of the mill case setup. It's super trendy and is made with premium materials. They are handmade using genuine British wax cottons and Italian leathers and they are also multi-functional. Well, the iPad 2 one is at least. It comes with an adjustable handle, so it can be made to look like a trendy handbag (or man bag chaps) and it can also be used to strap an iPad 2 onto a car headrest so the kids can watch Rastamouse on the iPlayer on the way to school. Of course, all these fine materials and hand stitching shenanigans come at a premium. The iPhone range is ?39.99 and iPad 2 cases are available from ?99.99. Not cheap, but if you show us a more stylish iDevice case then we'll eat our handmade Italian leather hat. For stockist details, check out Pipetto.co.uk. Since BUILD 2011 came and went, with it also coming the Windows 8 Samsung tablet presentation, it’s now for a long awaited duel: iOS 5 vs Win 8. The battle takes place by confronting an iPad 2 with the newest Apple OS with the tablets available for testing at BUILD 2011. I’m guessing that this is the Samsung tablet they’ve used for demos, but if I’m wrong, feel free to correct me. The author of the comparison video is winrumors, that takes us through a 11 minute tour of the iPad 2 iOS 5 duel with the new Windows tablet. If you’re familiar with the Metro UI from WP7, you’ll feel right at home in Windows 8, but you can always opt for the classic Win 7 desktop view if you want. I’m guessing you won’t, since it’s more intuitive to use tiles, gestures and the cool multitasking system available. What these platforms have in common is a list of available apps and as far as virtual keyboard goes, I have to admit that the one on the iPad 2 looks more comfortable. I’d have to test the keyboard on the Windows 8 slate to judge for myself… If you feel that there’s any bug, lag or glitch in Win 8, worry not, as we’ll have to wait a couple more months till it comes and everything will be fixed. The folks of anandtech recently decided to take the Samsung Galaxy S II for a spin and did an extensive review of the device, including tons of benchmarks. These showed, among others that the handset comes with a very powerful GPU. Also, it showed that the iPad 2 is two times more powerful than the Galaxy S II, as far as graphics performance is concerned. The iPad 2 uses a PowerVR SGX 543MP2 GPU that we’ll most likely find on the iPhone 5 as well, so in upcoming benchmarks expect the Galaxy S II supremacy to be removed. The only aspect where the Galaxy S II fails it he triangle throughput, where the iPad 2 once again rules, getting 64.9 millions of triangles per second. Apple has already started working on the iPad 3 and securing deals with Simplo Technology Co. and Dynapack International Technology Corp. These will supply battery packs for the upcoming iPad, according to Taiwan Economic News. The new power source will be thinner and lighter than the batteries that Apple used previously in iPad 2 models. The result will be an increased cost in the power packs used by the Cupertino company, of 20% to 30%. According to the same report, the new iPad 3 batteries will provide an even longer life than the 10 hours we got from the iPad 2, which is a brilliant feat. With Sony Tablet S and Tablet P official during the IFA 2011 preview event, it’s now time for a brief hands on experience, one that’s shown in the video below. What we can see here is the Honeycomb Sony device pretty much doing nothing but staying in the web browser, if I’m not mistaking. The comparison with the iPad 2 is a pretty brief one and focuses more on the thickness of the two products, with the winner being of course the slim Apple unit. I’m not a very big fan of that folded magazine design of the Sony Tablet S and the buttons on its side seem pretty hard to reach, if you ask me. Also. I consider Honeycomb a not so mature OS and look forward to see how Sony customized it and what they brought as extras. The display looks great though and I sure hope that that wasn’t the maximum brightness on it, or else we have a problem. We’ll be back with more details on this newcomer straight from IFA 2011 in the following hours! The HP TouchPad never really stood a chance if murmurs emerging from the webOS locker rooms prove to be true. TheNextWeb is reporting that HP's own web engineers were using an iPad 2 (using web based apps) to test the functions of webOS, as the TouchPad hardware was too slow. Apple's machine ran apps twice as fast a source claims. It's perhaps not surprising that a dual-core A5 chip was able to outpace the single 1.2GHz core in HP's tablet - but what is shocking is the fact that the TouchPad was apparently two years in the making; originating well before HP's takeover of Palm, and with the suggestion that webOS was made to be a square peg to fit its round OS shaped hole. The word is that the webOS team wanted the TouchPad and the new Pre phones gone as they were restricting what they could do. The rumoured HP TouchPad Go 7-inch version that has been doing the rumour mill rounds is apparently real - and a much better device - but there are doubts that this will get a release now. There's also talk that a next-gen device with a Retina-like display was in the works too. But, with HP effectively killing off webOS, at least on its own devices, that's hardly likely to see the light of day now either. While the iPad still reigns as the tablet to beat, Android’s tablet presence is growing steadily. Over the past year the Google tablet collective has managed to siphon off 20 percent of the iPad’s global market share, according to ABI Research. The number is promising, but the reality is that no single tablet has been able to make a real dent in the dominance of Apple’s product. Analysts point towards pricing as Android slates tend to “de-feature” themselves to appeal on a cost level while the iPad 2 has been released with many upgrades and no change in the tablet’s $499 price tag. Still, the statistics mirror Android’s rise in the smartphone market, showing a group of devices gaining traction among consumers. Unless you've been living down a hole for a couple of days (or been busy kicking in windows in your local high street) you can't fail to have noticed that Apple and Samsung have had a bit of a ding-dong over patent issues with the Galaxy Tab 10.1. But when it comes down to manufacturing matters (i.e. 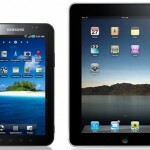 money making) it seems that Apple and Sammy are still the best of buds, with reports that Apple is turning to Samsung for panel displays for the iPad 2. LG currently produces the iPad sequel's screens, but reports suggest that there have been quality issues as of late and shortages too, leading to a suspension of orders and a look elsewhere. Apple is also apparently considering using Foxconn affiliate CMI for panel production if Samsung decides that the Galaxy Tab 10.1 issue would prevent it making displays for its rival. Samsung already makes the processors that power Apple's tablets and phones. There have been plenty of Apple manufacturing stories doing the rounds as of late, with rumours that Apple may even ditch Samsung entirely for chip production on the iPad 3, and also murmurs that Foxconn may also get the chop too, in favour of Pegatron. We suppose that when you're officially the biggest company in the world, you can afford to be choosy when it comes to buddying up.